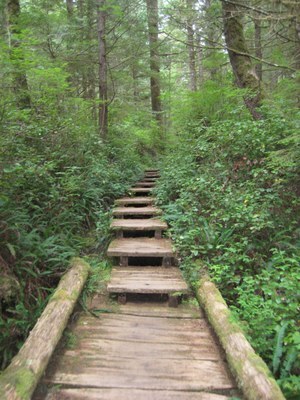 Located on the Olympic Penisula, the Ozette area is home to a renowned loop hike and famous archaeological site. Learn more about this incredible area and how you can plan your own trip. The Ozette Loop, often referred to as the Ozette Triangle, is located on the Olympic Peninsula and offers spectacular coastal scenery. Ozette is the ancestral home of the Makah, and the site of a world-famous archaeological discovery. Here are some ways you can enjoy the hike and learn more about Makah culture. In 1750, an earthquake along the Pacific coast triggered a large mudslide, covering a Makah village. The Makah recorded the “great slide” through oral history; years later an archeological discovery would confirm the Makah’s account. Storms and tidal erosion began exposing older parts of the village from 1966 to 1970. The lucky hiker and Washington State University researcher Richard D. Daugherty came upon the site and notified Makah tribal elders, which subsequently led to an excavation of the site. From 1970-1982, Washington State University students and members of the Makah Tribe embarked on a partial excavation of an area of the village. This work resulted in the recovery of 55,000 artifacts, held at the Makah Cultural Center and Research Center. Visitors can visit the center and view these 300-500 year old treasures. It’s definitely worth a trip! The triangle begins at Lake Ozette. Upon reaching the junction, my preferred route veers right onto the Cape Alava trail. This trail reaches the beach at 3.4 miles and passes through Ahlstrom’s Prairie at 2.25 miles. Much of the path is on a cedar plank boardwalk up off the forest floor. It meanders through a dense forest of western redcedar, hemlock, fir, licorice ferns, salal, bunch berry, and evergreen huckleberries, opening up to a broad meadow where we saw plenty of blue gentian and skunk cabbage as well. After reaching the junction for the beach, we started working our way towards the petroglyphs at Wedding Rocks. These include fertility symbols, whales, masks, and even a schooner. 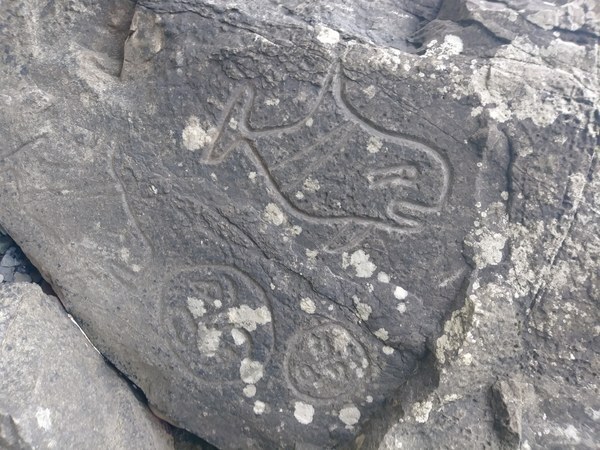 Petroglyphs are sacred archaeological artifacts and should be treated with care. Please restrict your contact to photographs. Continuing the hike from Cape Alava to Sand Point, the mileage is 3.1 miles – be prepared to walk on rocks and soft sand, and beware of tides. Upon exiting the beach at Sand Point, the trail heads back to Lake Ozette. It is a 3-mile jaunt, again on cedar plank boardwalk through forests. A brief stint through the southern end of Ahlstrom's Prairie brings you back into the forest, and back to the Ozette Ranger Station. Difficulty: Moderate. The boardwalks can be slippery, uneven, and loose. Attractions: Wedding Rocks, the petroglyphs, Ozette Island, and possible wildlife, including birds, otters, seals, whales, bears, deer, etc. Directions can be found online. Bring a map and a tide chart to plan your route. Look over your map for the route you will follow. Note any locations where you see the words "danger," "caution," or "round at low tide." If your map does not include this type of information, obtain a map that does. See the map key for definitions of hazards. Be prepared to hike over headland trails during high tides. Some headlands cannot be rounded during low tide. When camping on the beach; Have the appropriate permits, camp above the high tide water line, store food in bear canisters (Ursaks are not recognized by the park service at this time), always follow the Leave No Trace principles, and take proper precautions regarding sanitation and water treatment. Campfires: Burn only driftwood. Due to tree and vegetation damage from campers, campfires are not permitted north of Yellow Banks to the headland at Wedding Rocks. This includes the Sand Point area.